This weekend was a little bit split as far as gaming goes. I spent about four hours in SkyForge and the rest of it wandering around in Final Fantasy XIV. I had a bunch of side projects that I never really got off the ground. One of the things about being a tank is that you are constantly getting called on to do tanky things. Last night for example, I had all intentions of simply wandering around the new zones doing hunt mobs, but I ended up getting drafted to tank both Neverreap and Fractal Continuum for a friend who just dinged 60. Since this would allow him to unlock the content, and be yet another possibility for a daily expert roulette, as well as providing three of us in the dungeon run some tasty tasty first time bonus, I did not mind giving up my relaxing evening of hunting to help out. Both runs went fairly smoothly other than Warenwolf falling off the side of the final boss in Neverreap. Luckily we had the stamina to go ahead and finish that boss without him. Fractal Continuum went extremely smoothly other than some annoyances with bomb placement on the final boss. Luckily the loot gods seemed to be at least a little favorable and Waren walked with a bow and some other items helping him inch towards that all too critical level 170 mark for Alexander. It is my hope that in this last week we will have increased our item level enough to be able to put a good attempt in on Bismarck Extreme tonight. I found out that apparently the dps constraint is that you be able to break the spine in a single attempt without also blowing every cooldown. Wednesday we were able to break the spine, but it was a “just barely” situation and we absolutely had to abuse every cool down available to get there. Last night I had a moment when I was overcome with warm fuzzies. Folks were doing what they always do and filling my screen with green happy spam, and somehow it came around to the discussion of the free company. I am not sure if I remember who started it but someone made the comment that they were happy that I had recruited them into the guild, because if not for that they probably would not be playing. Then in a burst of activity a bunch of people chimed in with pretty much the same thing. So I wanted to talk a bit this morning about how much all of my guildies mean to me. There are so many days where I have had a rough patch, that I can log into our free company and within moments of seeing the cheery conversation I am in a much better mood. 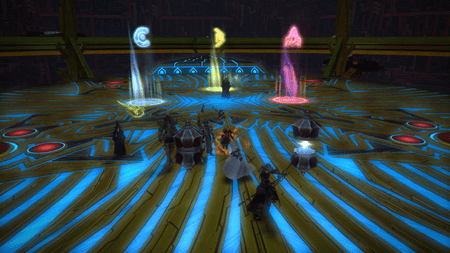 Having a happy guild family is ultimately what helps me keep returning to one game over another, and ultimately is what keeps me engaged in Final Fantasy XIV. Sure the game is awesome, but having this big group who is willing to drop what they are doing to help someone else out, makes the experience so much better. Yesterday during the evening I worked through a backlog of dungeon runs that I had recorded, and came across a video that didn’t turn out quite as intended. 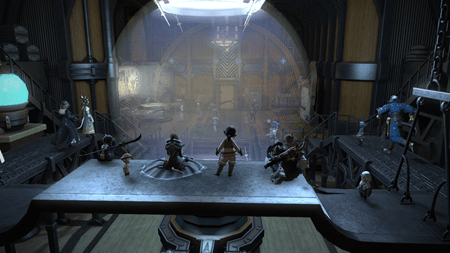 Since the launch of Heavensward the guild crafters as lead by Solaria have been working away on making us an Airship. When it came time to launch it for the first time a good chunk of us gathered in the workshop basement of the guild hall. In part we hoped a cut scene would happen, and as a result I had OBS rolling away in the background recording the event. While the event did not turn out as I had expected, looking back on the footage it makes me exceptionally happy to see so many of my guild members roaming around in one place. I love the housing district for the constant flow of guild members popping in and out as they go off to other adventures, and this moment was probably the largest meeting of sorts we have had. It made me realize that we need to do something like this more often. 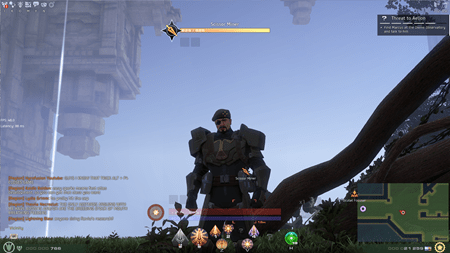 The SkyForge open beta finishes up this Wednesday and in the mean time I plan on playing for a little bit each night. I have to admit while there are still problems with the game for me, it is growing on me in ways I can’t quite fathom. During yesterdays run I finally figured out something that had been bugging me. I said in my videos and in my blog posts that it seemed like the combo system was largely ineffectual, and for the most part this is true. However I noticed on my character to the right of the health bar was a charge counter of sorts marked with a lightning bolt. This is directly above the dodge counter that shows how many times in a row you can dodge, and how long before the counter regenerates when they are all spent. This lightning bolt number tied to the special combo attacks, and if I use a combo while I have a charge available it does significantly more damage. However any additional combos while that charge is regenerating end up being largely useless. Knowing this is a thing, made combat feel more purposeful. Essentially I had one special move to use every 30 seconds or so, because that seemed to be roughly how long it took to regenerate a charge. When that ability was not available however I could happily wail away on the target then set up for the next special attack. This little bit of information seemed to dynamically change the way combat felt. Additionally doing the more open world zones, seemed much more enjoyable to me given that if I started wailing away on a boss, chances are someone would come along behind me to help me finish it. Running around with a group of other players also made me realize just how little damage the paladin does comparatively. In all honesty… I might end up playing quite a bit more of this game because it feels like I am starting to grasp the reason why it does the things it does. 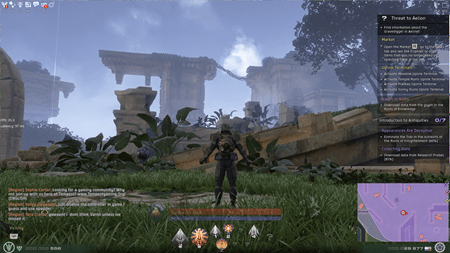 It is not the sort of game I would ever play as a primary mmo, but I have been enjoying playing it in these short bursts, where I complete a single objective and then log back out for awhile.